StoreSMART's 10-Pocket Plastic Organizers are a unique solution for storing your vital paperwork—but they're also ideal for showing it off! With two crystal clear 8 ½" x 11" pockets on the front and back covers, your hard work will transition seamlessly from the office to the boardroom. Use the exterior pockets to house title pages or presentation outlines, and tuck your content inside to create effortless training packets, proposals, and product brochures. Each page of our 10-Pocket Plastic Organizers is constructed of 100% super polypropylene archival material to help protect your valuable documents, and unlike paper folders and organizers, they won't tear, wilt, dog-ear, or discolor. A professional business or medical environment demands professional materials. Don't settle for anything less—choose a paperwork organizer that can stand up to the toughest treatment, and come out looking as fresh as your ideas. Four gorgeous color schemes to help you stay organized. Inside pocket dimensions: 4 ½" crystal clear pockets on all ten interior pages. Interior folder capacity: Holds 70 sheets per side. Use our 10-Pocket Plastic Organizers to create personnel or patient files—slide a piece of paper with the recipient's name into the clear front cover, and place relevant information inside the organizer. 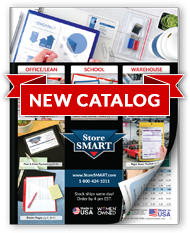 Looking for a way to create quick marketing materials, or need to present clients with a comprehensive bundle of catalogs, order forms, and other paperwork? These organizers are an attractive solution! I use my 10-Pocket Folder for my grading sheets for homeschooling. I also use them to organize my medical records for my husband and myself along with organizing my college classes. They are great!